Because replacing the weights causes Seemore stress, she needs a better method for readjusting her buoyancy. Since last summer, a team of mostly undergraduate University of Minnesota students has been designing one for her. After a June 2017 CT scan at the U’s Veterinary Hospital, the students, led by mechanical engineering graduate student Davis Fay, took the data and started designing what they call an "exoshell" for the 100-pound turtle. Using equipment from the U’s Institute for Engineering in Medicine 3D Printing Core, the team printed a 3D prototype exoshell. For students involved in the partnership with SEA LIFE, working on this project has provided a unique opportunity that they wouldn't get anywhere else. Other students found the project to be an excellent way to apply their skills. Seemore is a green sea turtle, the second largest species of sea turtle. SEA LIFE provides permanent homes for damaged and disabled creatures like Seemore that have been rescued and need a home. SEA LIFE Aquarium got her from the Sea Turtle Hospital in Marathon Key Florida after they deemed her un-releasable. If you'd like to support University of Minnesota College of Science and Engineering student projects, visit our CSE Giving website. 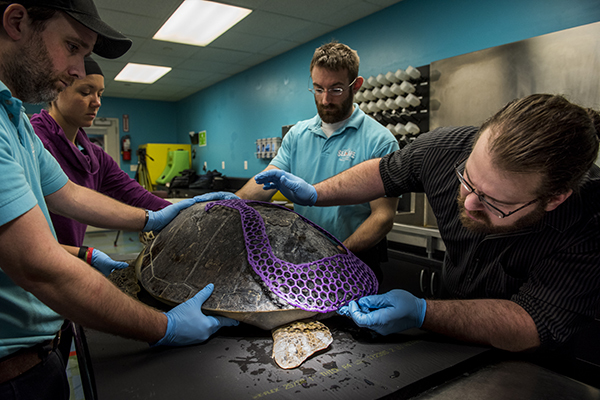 In January 2018, students and staff from SEA LIFE Minnesota Aquarium performed a fitting of the prototype 3D-printed exoshell on Seemore, an injured sea turtle. The team hopes to have a permanent exoshell this summer.